UNITED NATIONS, Mar 16 2017 (IPS) - Increasing travel restrictions have prevented delegates from attending this year’s UN Commission on the Status of Women (CSW), according to several women’s rights groups. The travel constraints go beyond U.S. President Donald Trump’s embattled travel ban on refugees and Muslim-majority countries, which was again blocked by a Federal Judge on Wednesday. 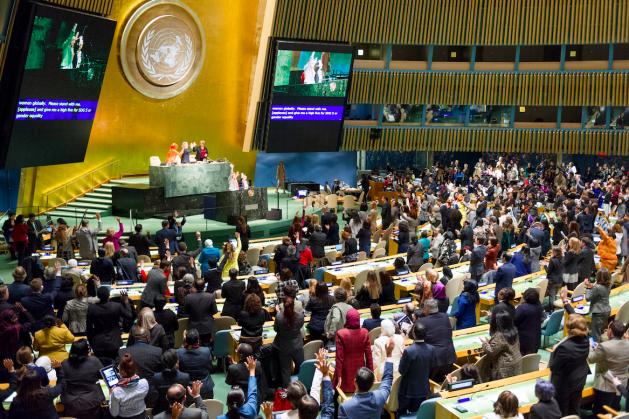 Although the Executive Order has not been re-enacted, women’s rights groups perceive that organising internationally is becoming more difficult. They report that some potential delegates were surprised that they were unable to obtain U.S. visas for the UN meeting; others were worried about increasingly strict treatment at U.S. airports; while others were prevented from travelling by their home countries. The annual Commission on the Status of Women is usually one of the most vibrant and diverse meetings at UN headquarters in New York with hundreds of government ministers and thousands of delegates attending from around the world. Sanam Amin from the Asia Pacific Forum on Women, Law and Development (APWLD) told IPS that two members of the group’s delegation from from Bangladesh and Nepal, countries that “are not listed in the first or second version of (Trump’s travel) ban,” were unable to obtain visas. “Multiple civil society organisations representatives from other countries are facing refusals and this is new to us, as we have never faced visa refusals after presenting UN credentials,” said Amin. Amin also said that she had “been in contact with UN Women in Bangladesh, in Bangkok (ESCAP) and in New York over the visa refusal issue,” for weeks before the meeting, trying to find a solution. “Those who were refused were expected by us to speak or participate in our side events and meetings with partner organisations and official delegations.” The APWLD, is an NGO which has accreditation with the UN Economic and Social Chamber. "Multiple civil society organisations representatives from other countries are facing refusals and this is new to us, as we have never faced visa refusals after presenting UN credentials," -- Sanam Amin. Representatives from civil society having difficulties obtaining visas to travel to attend UN meetings in the United States pre-dates the current Trump-Republican Administration. The U.S. Department of State advised IPS that it could not comment on individual visa cases. However while there are many potential reasons why visas may be refused, several groups perceive travel becoming more difficult in 2017. “It’s incredibly ominous to have women’s rights activists feel like the revised executive order and overall hate rhetoric from the Trump administration makes them feel unsafe coming to this CSW and that is what we have heard,” Jessica Stern, Executive Director of OutRight Action International told IPS. Both Stern and Amin expressed concern about the implications and meanings of the travel ban, even though the courts have continued to keep it on hold, because even the revised ban, specifically restricts travel for nationals from Iran, Libya, Somalia, Sudan, Syria, and Yemen. “The ban text even cites violence against women – in section one – in the six countries as reason to ‘not admit those who engage in acts of bigotry or hatred’,” said Amin. “In fact, it (would restrict) civil society from those very countries from participating in events such as CSW. Instead, their governments are emboldened to take more regressive positions on women’s human rights, and the U.S., with its Global Gag Rule among other anti-women policies, is taking its place side-by-side with the very countries it has targeted with the ban,” she said. Stern added that the theme of this year’s CSW – the economic empowerment of women – should not be a politicised issue. “(It) should be a non-partisan issue that every government in the world can get behind because every government has a vested interest in the eradication of poverty and national economic development and we know that women are the majority of the world’s poor and so if you empower women economically than you empower families communities and nations,” said Stern. She emphasised the importance of the meeting as a global forum for people who are actively working for gender justice around the world to speak with governments. At the CSW “thousands of activists for women’s rights and gender justice (speak) with every government of the world to say what struggles they have from their own governments and the kind of accountability that they expect from the international system,” says Stern. The rights organisations sponsoring the No Borders on Gender Justice campaign include: MADRE, Just Associates (JASS), Center for Women’s Global Leadership, AWID, Urgent Action Fund, Women in Migration Network and OutRight Action International.